At the time of the Reformation, Salzburg was a centre of wealth on a European scale and a centre of power on a regional one. No wonder that new ideas made it quickly to the city, and even more importantly, to the underprivileged peasants in the south of the province. Landless farmers, artisans and miners (even though the latter ones were rather well-paid by the standards of their time) converted to Lutheran Protestantism in great numbers. Salzburg being a Catholic church-state ruled by a Prince Archbishop was naturally not amused about this. Serious steps were taken against the Reformation, leading to the expulsion of many Protestants on mainly two occasions (with some other minor pogroms): The first one in the late 16th century can be seen as a typical phenomenon of its time; the second one in the mid-18th century occurred at the peak of enlightenment and caused European-wide protests. The Salzburg Protestants did not recover from this blow; after 1732, Lutheran activities were minor. Freedom of religion in the modern sense was only granted with the secularisation of Salzburg in the course of the Napoleonic Wars. In 1806, Salzburg became part of Bavaria, later of Habsburg Austria at the Vienna Congress in 1815. Before we sound all too critical about the expulsion of Protestants: Lutheran theology was only one side of the medal; for centuries, religious conflicts were only one aspect of social and political warfare. In a Catholic state with a Bishop as the landlord, a Protestant denomination was automatically a subversive if not hostile political statement. However, times changed and in the 19th century, the Protestant community of Salzburg saw a steady increase. By 1863, the community had collected enough money to build a representative, new church close the city centre. Quite a statement: The new era of religious freedom was met with the construction of a spiritual centre right at the heart of the (former) enemy, in a style of a foreign power - the architects chose to design a brick building in the style of Northern German churches. Even though it was "Austrianised" with various Historicist references to Gothic, Romanesque and Renaissance features. In the course of the war of Austria and Prussia against Denmark, 370 Danish prisoners of war were kept at the Festung Hohensalzburg. They contributed to the construction of the new Christuskirche. The building was completed in 1867 and consecrated the same year. The Christuskirche was the first Protestant church in the province of Salzburg. Today, the church is open for visitors during the day; note the paintings that depict the Lutheran peasants that swear an oath before they are being expelled. There are other references to the expulsion in the church, too; the descendants of these original Salzburg protestants live in the territories of former Prussia, in other parts of modern Germany and in the US. Some communities have preserved customs and other cultural references to Salzburg. 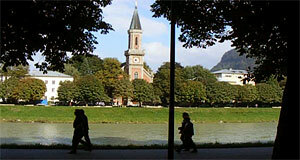 The Christuskirche can be found on Schwarzstraße, directly by the Salzach River. It faces the Altstadt or Old Town and is open from 8.30 am to 6 pm (only in winter it closes after dusk). Every Sunday at 11.00 am, there is an English service held at the Christuskirche.